Mutual fund houses (including UTI) have invested R2,064 crore during January-March 2011 as compared to shares sales of R4,524 crore in the previous quarter. In the process, it has increased share stake in Sensex companies. 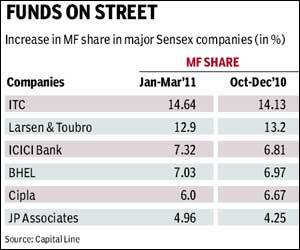 MFs have increased holdings in as many as seventeen sensex companies in the fourth quarter of the current fiscal. Hero Honda Motor saw the highest increase in MF stakes to the tune of 1.15%. HDFC Bank, Tata Power, J P Associates , Maruti Suzuki, Hero Honda Motor, ICICI Bank and ITC were among the other companies in which MF increased stakes during the quarter. In contrast, MF reduced stakes in Hindalco Inds, Tata Motors and DLF. The average share of MFs stake in total of 30 sensex companies increased from 3.87% to 3.98% during the study period. The top 5 companies according to MFs stakes as of March 31, 2011 were ITC, Larsen & Toubro,ICICI Bank, BHEL and Cipla. Among the above top five as on March 31, 2011, highest decrease in MFs share was registered in the case of pharma giant Cipla.It saw MFs holdings in the pharma giant decrease to 6% during Jan-March 2011. As compared with the last quarter, public sector giant ONGC saw holdings of MFs investors in the firm decreasing marginally from 2.11% to 2.1%. On the other hand private sector giant Reliance Industries MF holdings increased from 2.28% to 2.59% during the study period. Less than 2% MFs share as on Mar 3111 was seen in the case of DLF, Reliance Communications, Wipro, Hero Honda Motor, Tata Motors and NTPC.